The Duchess of Cambridge revealed her new, retro-inspired cut last night at the opening of the Natural History Museum’s Treasure exhibition in London. 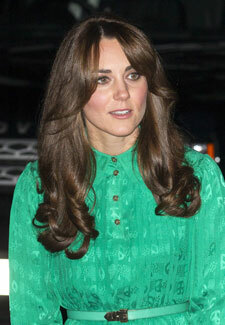 Wearing an emerald green dress by Mulberry, Kate showed off her new layered haircut. It’s thought that the style was the work of Sloane Square hairdresser, Richard Ward. Kate has updated her lengthy, one-length style with a few face-framing layers and a sweeping fringe that she has parted just off-centre. Her new ‘do was styled with a seventies-inspired flick and Kate’s trademark tumbling curls. And it seems the new cut is going down well with the critics. Discussing Kate’s new ‘do, Michael Lendon, creative director of the Aveda hair institute, told the Mail Online: ‘The new layers around the face will allow Kate to go for different styles. What do you think of Kate’s new style?